A habit of hovering with little movement in the water makes the sand tiger shark a great ambush hunter. They are also known to form small groups (shark groups are called shivers) while pursuing larger schools of fish. Bony fish, smaller sharks, lobsters, squid and crabs are all potential prey. Sand tiger sharks inhabit warm, shallow, coastal waters around several countries, including the Atlantic coast of the United States. They are notably absent from the eastern Pacific. These sharks swim throughout the water column but spend the majority of their time near sandy bottoms and rocky reefs. These fish swim with their mouths agape, revealing up to 94 teeth, which has earned them the alternative name of ragged-tooth sharks. Despite their fearsome, toothy appearance, sand tiger sharks are not aggressive sharks and very rarely attack unless they have been intentionally provoked. Although sand tiger sharks have a wide distribution globally, they are listed as vulnerable to extinction. Certain subpopulations near Australia are critically endangered. This shark is occasionally hunted as a food fish, caught for sport, and caught unintentionally as bycatch. It gives birth to only one or two pups at a time every two years, which makes it particularly vulnerable and slow to recover. Instead of having a single uterus, female sharks have two (plural: uteri). As sand tiger shark pups develop in their mother’s uteri, the largest ones eat their own siblings. A female may have up to 23 fertilized eggs at the start, but only one or two pups survive. The sand tiger shark pups hatch from their eggs within the mother’s body. They are already close to three feet in length when they are born and swim freely. Sand tiger sharks are able to stay nearly motionless in the water by gulping air. They retain this air in their stomach where it keeps them close to neutrally buoyant. Sand tigers are the only sharks known to do this. Sharks are classified as fish, but unlike the fish you are most likely to find on your dinner plate, sharks have no bones. Instead their skeleton is made up if cartilage, the same flexible material you have in your nose and ears. Sharkskin is rough and similar to sandpaper in texture. This is because the skin is made up of scale-like teeth called dermal denticles. In the past, sand tiger sharks were hunted for food, leather and oil. They are still occasionally hunted for food or sport, particularly in Japanese coastal areas. Some sand tiger sharks become trapped in mesh used to fence off swimming areas and protect beachgoers from other sharks. Many more are caught each year as bycatch, meaning they are unintentionally harvested along with more desirable fish. Sand tiger sharks were given protection in 1984 in New South Wales, and later by the Commonwealth of Australia. These subpopulations of sand tiger sharks are in dramatic decline. In 1997 the sand tigers that live along the Atlantic coast of North America received protection, too. 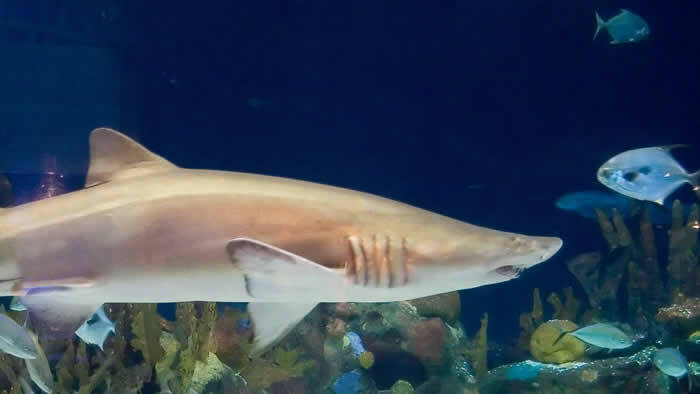 The Minnesota Zoo is a member of a breeding group set up under the Association of Zoos and Aquariums’ (AZA) guidelines that assists in cooperative efforts to gather information and formulate a plan for captive breeding of sand tiger sharks. The goal of this plan is to have a breeding population in aquariums so that the collection of wild caught sharks for display is reduced.